Case in point: I recently observed the phenomenon in a hedge along the front of the house… It hadn’t been trimmed in a while and isn’t known to flower, yet suddenly towering shoots appeared to be sprouting from it with clusters of orange flowers bursting forth. After a closer look I realized that the shoots weren’t part of the hedge, but a vine not included in the original landscape plan that had arrived of its own accord, in a defiant act of self-propagation. Now it was entwined with the shrub—its trailing shoots cascading down and showing off colorful blooms. 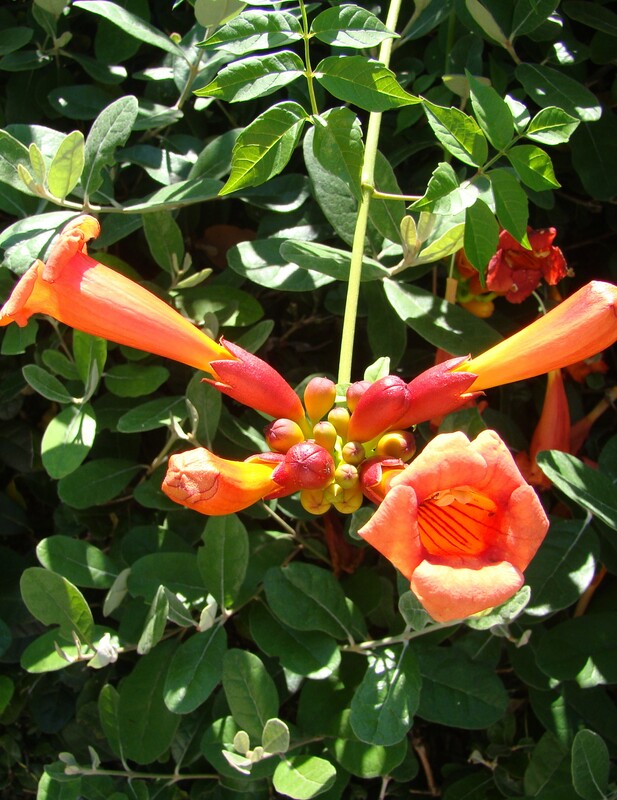 A little research identified this spontaneous sprouter as trumpet vine, a resplendent beauty that doesn’t deserve to be mixed up with a soon-to-be trimmed hedge that doesn’t fully appreciate it. So, I’ll have to find a way to relocate it and give it true pride of place. Apparently, trumpet vine may require some monitoring as it can be a bit of a wild card—but I like that in it… Fighting for its individuality among the well-manicured shrubs of the world. I can’t think of a more lovely way to announce (in splashy fashion) that spring has taken early leave, and yes, the “summer” heat is on!